Today I want to share with you my challenges and wins in writing a thesis paper, provide you with a piece of advice to improve your online learning experience and propose some recommendations to advance this course. First, to my fortune, I easily chose the topic of my research that I am passionate about: teacher leadership. BUT! It was not so easy to identify the focus of research, because leadership is very broad and big phenomenon. 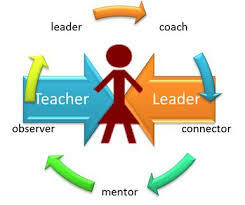 Then I decided to compare two perspectives on teacher leadership: principals` and teachers`. Because in most cases the big difference in interpretation and perception can lead to misunderstandings and misleading practice of leadership roles. Next top to climb was the formulation of research questions. It was so hard sometimes to stay focused on research vision and purpose. Different irrelevant and vague questions came to mind. My instructors` supervision and guidance saved the situation. Thirdly, literature review. That was the most challenging mission for me! I have found tones of articles, and all of them seemed so important, I decided to include them all, staying behind the research topic. As a result, primary version of literature review looked as a silly shopping list. Last concern was connected with interview questions. What I need to ask to reveal the valid responses and get reliable findings? The questions seemed very broad and far from the research focus. However, this course helped to fix some practices in stating the research questions, organizing literature review, selecting and justifying proper measurement instruments and methods. Weekly writing assignments with limited word count, attached guidance and clear instructions helped me to represent the ideas as concise and transparent as possible. I used to apply long and descriptive introductions, where in the surge of hundred words the reader cannot get the main idea and gets lost. Robyn suggested me to wear the potential readers` shoes and use short and simple constructions easy to understand. The only 2 suggestions I would like to promote is changing the format of this course. I suppose it is rather better to organize it as a blending course. When students can attend face-to-face elective courses and then have some practice at home and submit the take –home assignments online. The second is to practice writing the mini-thesis during the first study year. It would be more beneficial to exercise mini-thesis writing skills before conducting a real master thesis. Otherwise, it is really distracting from the main full-thesis. P.S. Through the thorns to the stars!!!! As a part of my mini research on online learning I was required to create a small scale survey or interview to administer to potential respondents; conduct the interview or survey and share about the process with you through posting a blog. So, as we know the advancement of technology, the Internet revolution and development of management systems have contributed to exponential growth of online learning in the higher education environment. However,people have not entirely accepted online learning as the solid alternative of in-class education. They still debate and argue about the effectiveness of online education. Moreover, there abound misconceptions, misunderstandings and misinterpretations that may prevent students from experiencing this mode of learning. In my small scale study I am researching online learning myths or misunderstandings that may prevent GSE students from accepting this type of learning experience. To explore, analyze, interpret and understand how has online learning been misinterpreted and how does this affect GSE students qualitative research design has been chosen. One-to-one semi-structured interview with open-ended questions was applied. Each interview lasted for about 30 minutes and was audio-recorded. The sampling procedure has been used in the study is convenience and purposeful sampling. It means all participants kindly agreed to take part in the research and students from four programs of GSE participated in data collection: Foundation, Bachelor, Masters and PhD. I selected students from different programs so that findings could demonstrate perceptions of online education specific for students of certain age, background and life experience. Even I organized probing interview with two of my group mates to be sure that I created the questions properly and the respondents signed the interview consent forms and were informed about the purpose and focus of the study, I have faced some challenges during the interview process. The first is that some respondents deviated from the questions, responded too general and I had to address more specific questions or repeat the question several times to get more credible and full responds. As a result, the interview lasted for 10-15 minutes more than I have planned. Secondly, some interviewees at the last moment refused to participate at interview due to unexpected circumstances. Moreover, one participant even did not come to interview without any excuses and I had to search and find another students who were eager to contribute. It also took time, patience and efforts. Despite these challenges I could say that it was excellent experience for me to be in a role of interviewer and discover different opinions, fears and values. The most surprising thing is that I have found the answers to my own questions since I’ve had my hesitations about online learning. Everyone of us aware about the significance and benefit of applying technology and digital devices in the classroom, however minor educators really use them in a proper way. Unfortunately, some teachers tend to accept “innovative” technologies as the source of entertainment, but not as a mean of learning process which facilitates the understanding and engagement. Moreover, unfortunately, another teachers are still savvy with electronic devices. Thus, it prevents them to apply and try out technologies in the classroom. Furthermore, teachers seem like afraid of loosing control and discipline in the classroom; when crowd of students are sitting in front of laptops or using their mobile phones to search information teachers do not not know how to manage this process of freedom and self-learning. It seems to them like students are just chatting or visiting sited irrelevant to the lesson. In addition, teachers tend to imagine themselves as the only monopoly who deliver credible and valid knowledge. This is not my subjective assumption; I have talked with different teachers. visit different lessons as a trainer and teacher, and myself also had the same concerns and hesitations on applying technologies in the classroom. One of my concerns was mobile phones and social networking – when I asked my students to use cell phones for some activities they immediately started to chat and “wander” in social networking sites. I could see it, slightly control, but I could not change their mind and persuade them to apply mobile phones rationally. When I came across with this video, I recognized the problem and felt like finding solution. This you tube video is called “Singapore` 21 st” – Century Teaching Strategies (Education Everywhere Series)”. The video was provided by Edutopia, a company dedicated to improving the K-12 learning process through innovations that prepare students to thrive in their studies, careers, and adult lives. This amazing video describes the experience of one of the Singapore top “future schools” in applying innovative technologies in education process to develop the 21st -century skills of learners. NGEE Ann Secondary School is famous for talented teachers who produce effective teaching materials and try to engage every student; effective education program that really works. Video shows how teachers of this school use technology for providing instructions, monitor the learning process and enhance self -regulated learning. Students use the instant messaging tools by Wiki, Facebook and blogs to put their concerns while lesson proceeds, another students may see the question on the screen and reply. The teacher sees the questions; observes how students interact with each other; and facilitates learning instead of lecturing and giving the right answer. It is so engaging! Pushing all 25 students, for example, in the class to participate and contribute is so hard. However, within opening 25 windows for 25 students you provide them electronic space for real-life learning, communication and discovery. Guys, you should click the button below and follow the video. I swear, you will absolutely enjoy video. As you can see from the puzzle above the literature review is the most extensive, significant and capacious part in the research writing process. 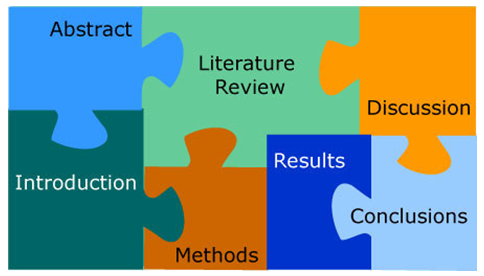 Moreover, the literature review is one of the most demanding tasks in the thesis writing. However, someone may supose that choosing a research topic and focus is rather difficult. But I think choosing a general thesis topic is relatively easy, but deciding on specific and realistic research questions requires considerable thought and enquiry. Appropriate and relevant research questions and the methods employed to answer them must be framed in the context of existing research. Furthermore, I would emphasize that a thorough, refined literature review is the foundation of solid research. The topic of my research is teacher leadership, whereas the main focus of the study is teachers` and principal’s perception and understanding of teacher leadership concept. In this regard, the main two research questions are going to guide my paper. The first research question: How do teachers and principals of selected school of Astana perceive the concept of teacher leadership? The second – How English teachers are experiencing leadership roles and addressing leadership distribution issues in their school? According to these research questions I organize my main themes and categories and designed concept (literature) map. This schedule is greatly contributing my deeper understanding of the issue. Moreover, it helps me grouping authors, who draw similar conclusions and noting areas in which authors are in disagreement. As a result, I can see three sections that will organize and structure my literature review. Firstly, I will discuss the definition and original meaning of teacher leadership. It is very interesting because different scholars define this issue from absolutely controversial angles. Secondly, I will critically analyze and evaluate findings provided by authors on teachers` perception of leadership. Thirdly, I would like to gather a representative collection of pertinent discussions about the ways school principals define teacher leadership, as well as how they perceive the roles, characteristics and qualities of teacher leaders. However, determining which literature is relevant to your research is challenging. Concerning challenges in finding and processing resources I would name four main difficulties: identifying relevant key words to search appropriate sources; relying on secondary rather than primary sources; existing gaps in research from Kazakhstani context; blindly accepting other researchers’ findings rather than critically examining them. Moreover, sometimes it seems I have found solid and reputable peer-reviewed article, however it is not available as a full text version. In overall literature review writing process I am at the stage of searching and processing peer-reviewed, updated and credible resources from Eric, Sage Journals, Google Scholar, Taylor and Francis databases and Nazarbayev University library sources. During this month I have been working on selecting scholarly papers and reviewing them. From last thesis seminar session I have found fifteen articles and nowadays I have selected eight more articles and one book. Fortunately, I have discovered that there are numerous studies on teacher leadership conducted in the frame of Kazakhstan and Central Asia by David Frost, John Macbeath, Silova and Niyozov. All over the world students completing their degrees have to learn and cope with two correlated missions such as creating and organizing research papers and formatting studies according to prescribed uniform styles, like Modern Language Association (MLA) or American Psychological Association (APA) guidelines. There are tones of resources available for students to apply in writing papers; diversity of articles and books contributes to broadening the perception, deeper understanding of issues deserving to be studied, providing an insight and inspiration to try out new methods and approaches of study. Moreover, there are many resources that focus on teaching and guiding within specific formatting style. However many of students often express frustration when formatting their papers aligned to definite style, which can undermine the quality of their research papers. APA format is very helpful in organizing the content, proper in-text citations, endnotes, footnotes and reference pages. In addition, this uniform style provides style guidelines helping to address clarity and conciseness and contributes to select certain words and terms. Furthermore, APA recommends us to use simple, understandable and precise language to avoid confusing the meaning. Moreover, APA helps to establish credibility and validity. Because for the reader it is more convenient to focus on more reliable source than on different distracting materials with uncertain and shady content. Finally and mainly, it protects against plagiarism, pushing us to use someone`s words and ideas in ethical and responsible ways. However, some students do not prefer APA formatting and find it restricted, because they may struggle with addressing the format mechanisms and meeting the requirements. They suppose APA makes their life complicated. The main challenges may happen with in-text citation, legitimate paraphrasing, summary and proper reference. I suppose these problems take place due to several reasons. The first reason might be silly and slight understanding of APA format demands. The second is poor self – organizational and self -regulation skills and irrational time management, when the person starts completing the literature review or any part of the assignment out of time, close to deadline. That is why students begin to plagiarize pretending to paraphrase with their own words, or overuse direct quotations. As for me, when the writer uses irrationally direct quotations it is very hard to see his/her own opinion, attitude and voice. Moreover, it makes the paper gray and static. Thus, it leads to lost of communication and dialogue with the readers, because I accept any study as the mean of conversation and interaction with potential readers. To wrap up, I think APA makes paper writing easier, more structured, logically organized and precise. When I have any difficulties I frequently consult Purdue Owl Online Writing Lab and use Citation Machine to organize properly citation and reference list. 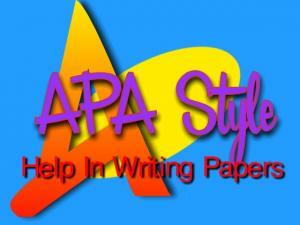 If anyone of us still feel frustrated applying APA style, I think it is just a matter of time, awareness and practice. By the way, what do you do to overcome the troubles with APA formatting? 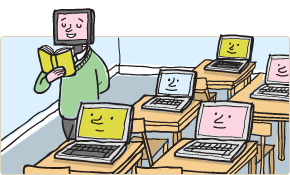 Web-based learning, electronic support, virtual classroom, digital collaboration…These ICT terms filled educational space and provoked new mode of learning. Online learning nowadays enhances and facilitates computer-mediated communications. Thus, it leads to significant changes in the way and approaches educators interact with learners. Regarding this issue, diverse group of scholars conducted numerous researches and elaborates different findings. In the stream of articles and research papers on this topic I found two articles reputable and worthy. These articles gave a general insight on everyday practice and bright future of online education in case of the USA. Mayadas et al. (2009) in the article “Online education today” emphasize the significance of online learning as the crucial mechanism of academic mobility; discuss application of online learning within several American higher education institutions; demonstrate common struggles and challenges traditional academic institutions face attempting to promote online courses. Arguments grounded on annual Sloan Consortium survey of online education, which reported that mostly for institutions introducing online classes this practice varies from early and experimental stage to routine and proficient level. Some universities offer online courses, however mainly through elective or extension courses; they offer no online degree programs. Whereas, another traditional private institutions provide no online education at all due fear that fewer faculty would be needed. However, in some benchmark universities the number of online student population becomes equal and identical to on-campus enrollment. Moreover, study remarks impact of online education on educators and learners. It takes much responsibility, rational time-setting and self-discipline in terms of students, because most of them are working adults who cope with family and work; whereas teachers have to be flexible, advance ICT proficiency, shift from face-to-face teaching to e-learning, virtual guidance and digital scaffolding (Mayadas et al., 2009). The second study supports and extends discussion related to online learning and proposes an idea that online education will obtain big approval and wide-ranging acceptance and application within the next five to ten years in America. Sener (2010) believes that big amount of student population will be involved in online enrollment, participate in online courses and gets high quality online education despite barriers hindering the advancement of online learning – faculty agreement, financial obstacles and bureaucracy. Author propounds several indicators of wide-spread online education such as proficient application of digital sources in teaching and learning, fluency of online education among students will become a tendency, big amount of students will attend at least one online course during one academic year and study period at college, online courses will obtain 20% of total credit hours in institutions. Furthermore, article promotes hidden forces that will facilitate “full scale adoption” of online education: socio-economic progress, familiarity, acceptance, diversity, unintended outcomes (Sener, 2010). Regarding strengths and weaknesses of online learning I could assume that flexibility, convenience and independence might be accepted as advantages, whereas delay of responses, lack of community, difficulty in understanding online instructions, technical problems could be identified as disadvantages. What do you think in this regard? Teacher leadership: fantasy or fact? The topic of my thesis is Teacher leadership. Although teaching has long been recognized as an important profession in Kazakhstan, the idea of teachers exercising leadership does not feature in public discussion and research. The growth of interest and discussions about teacher leadership in the international literature suggests that it should be brought into the debate in Kazakhstan. Moreover, while the concept of teacher leadership is generally defined, the perceptions of teachers and administrators do not always align with each other, posting challenges in the educational setting (Silova, 2009). My research aimed to distinguish whether Kazakhstani teachers and principals face the same issues. In addition, my research explores the potential for developing non-positional teacher leadership (Frost, 2014) in the schools of Kazakhstan. The analysis focuses on teachers and school administrators` perceptions of the potential for teacher leadership and the conditions on which it might flourish. The paper seeks to identify the factors could facilitate and enhance teacher leadership in the country. I hope, the findings will be beneficial for teachers to establish clear mindset on teacher leadership concept, for carrying it out properly in a practice. Moreover, study may give an insight for school administration to reframe and revisit school management system and capacity building within teacher leadership. I can confidently say that the most helpful course for me was Leadership, Planning and Change Management conducted by Chris Ingate, PhD in Educational Leadership and principal of one of the secondary schools in UK. This course was significant and worthy because I clearly understood what leadership is; that leadership starts from building capacity and establishing trust among school community members. Moreover, this course gave an insight on how leadership should be perceived and distributed in schools. As a result, I decided to conduct a research on the issue of teacher leadership in Kazakhstan. Concerning the most helpful reading material, I could name a masterpiece written by John W. Cresswell – Educational Research: Planning, Conducting and Evaluating Quantitative and Qualitative Research. This book is fundamental, extremely rich and self-sufficient. It is thanks to this book I learned how a competent, well-organized and successful research should look like. Last year was challenging and struggling for me and I suppose for everyone in our group. Because we had to cope with work, study, household routines simultaneously. It took much effort and required effective and rational time management, proper arrangement of priorities and everyday agenda setting. This year is going to be both easier and harder for me. It might be easier because now I got used to intensive rhythm of studies. I am quite familiar with assessment procedure. I am aware about significance of keeping deadline to succeed in assignments. However, this year is the last and we are required to write a thesis which demands big responsibility and enthusiasm. Silova, I. (2009). The crisis of the post-Soviet teaching profession in the Caucasus and Central Asia. Research in Comparative and International Education, 4, 366–383.